Wikimedia UK receives an unusual donation… | the Wikimedia UK blog! Towards the end of 2013 there was an interesting discussion on a Wikimedia-related email list regarding whether the movement should accept donations in alternative currencies, such as Bitcoin. Well, we certainly didn’t get any advance notice, but today saw the delivery of this herd of cattle. As you can see, Peter the Platypus is already making them feel welcome – and no doubt making sure they know not to put ginger nut biscuits in with any other biscuit. 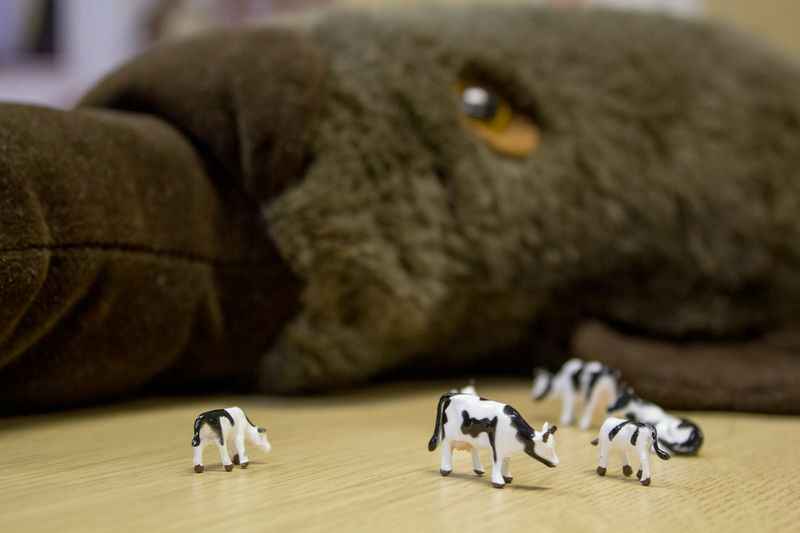 This does raise some questions: Does anyone have any tips on how to care for plastic cattle? Who is the kind-hearted yet anonymous donor that sent us this generous gift and how can we say thank you? What should the cattle be called? And did they sign a gift aid declaration?